2018 Tax Extension Forms Online | E-File 4868, 7004, 8868 & 8809 Now! 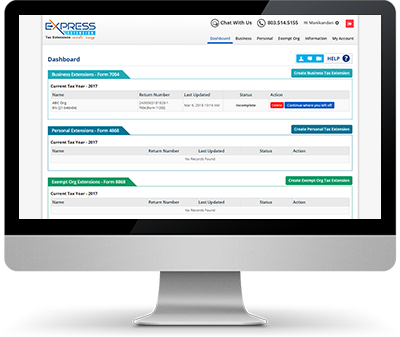 E-file Form 8868 securely with IRS-authorized e-file provider ExpressExtension and get 6 more months to file. 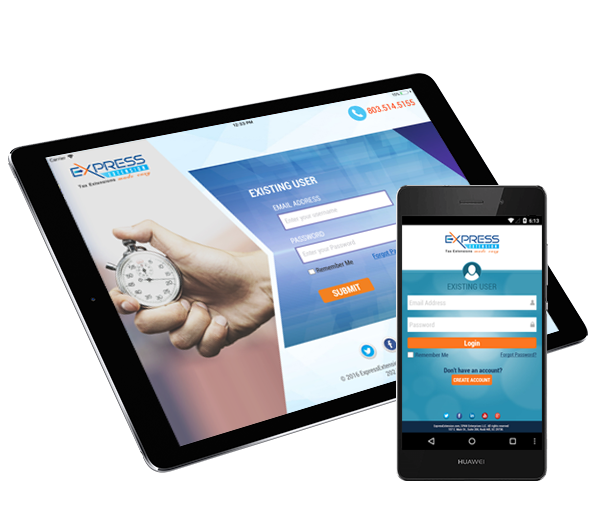 It only takes a few minutes to e-file Form 7004 with ExpressExtension for a tax extension of up to 7 months! Quickly and easily extend your personal filing deadline to October 15th by e-filing Form 4868 today. E-file with ExpressExtension for a 30-day extension to file your 1099s, W-2s, ACA, and other information returns. $14.95?! That's it? Fantastic. This is the first time in 18 years I haven't had to go to the IRS office. I love you guys! Liked the initial screen which presented clear options to click to start the return I wanted and showed the price. Need more time to prepare and file your federal tax return? ExpressExtension provides information on how to apply for an extension of time to file your Individual, Business, and Exempt Organization Income Tax Returns. The IRS doesn't require a reason to extend, and it's automatic! If you are unable to file your Personal, Business, or Tax-Exempt returns by the original due date, you may be able to get an extension of time to file from the IRS. To apply for an extension, simply e-file IRS Form 4868 (personal), 7004 (business), 8868 (tax-exempt) or 8809 (information returns) with ExpressExtension, and you could get up to 6 more months to file your return. Keep in mind; extensions give you more time to file, not to pay any taxes owed. For more information, call 803.514.5155 or email support@expressextension.com. 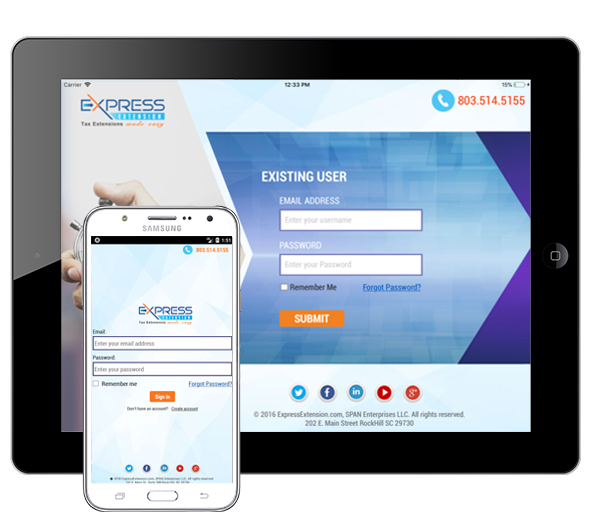 File on the Go with the App from ExpressExtension! Now you can e-file your Business, Personal & Tax-Exempt extensions with Form 4868, Form 7004, and Form 8868 from any location using our mobile apps for iPad or Android tablets. Now you can e-file your Form 7004 from any location using our mobile app that's available for iPad and any Android devices. Now you can e-file your Form 7004 from any location using our mobile app that's available for iPad and Android devices.